The Olympic skater convicted of murdering her husband. Yvonne De Ligne achieved her best result in her first major international competition, debuting with a 6th place at the 1929 World Championships. She would match that performance in 1932, placing also sixth at the 1932 Olympics. In the European Championships, her best result was a 5th place, in 1933. 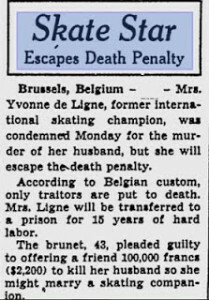 De Ligne was married to speed skating Olympian Charles de Ligne, but their marriage was not a happy one. During World War II, she fell in love with a Dutch figure skater, Jacob Hartog, who was living in Antwerpen at the time. Catching his wife and her lover in their home, Charles de Ligne kicked out Hartog. Yvonne de Ligne was unhappy with this, and sought revenge. In November 1944, she led her husband to their countryside hideout. Armand Michiels, convinced Charles was a collaborator, was also “invited”, and killed him with a German weapon, to make it look like he was shot by the Gestapo. But the plot was discovered, and both Michiels (3 years) and De Ligne (15 years) were sentenced to prison terms. 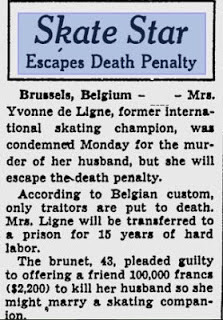 Yvonne de Ligne was released after serving six years, as she was suffering from tuberculosis, and died very shortly thereafter.